The Idaho eviction notice forms are used when a landlord is seeking to inform the tenant of a breach of the lease or to inform the tenant that the lease will terminate. If the notice is for breach, the tenant has three days to rectify the problem, either by paying the entire amount of the rent due or by curing the breach depending on what the notice states. Effective notice by the landlord is accomplished by either delivering the notice in person or by posting, mailing and leaving a notice with an adult located at the premises. If the tenant fails to respond, the landlord may begin the eviction process by filing an Unlawful Detainer Action with the Local District Court which contains a Summons and Complaint. Affidavit of Service – This form must be completed with any of the notice to quit forms. 3-Day Notice to Quit (Non-Payment of Rent) – This form is used when the tenant has failed to pay rent in accordance with the terms of the lease. The landlord must give the tenant three days to pay before eviction proceedings are begun. 3-Day Notice to Quit (Non-Compliance) – This form is used when the tenant has failed to abide by the terms of the lease other than for non-payment of rent. The landlord must give tenant three days to fix the breach before beginning eviction proceedings. 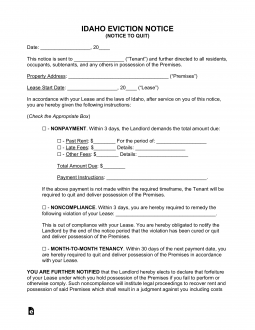 30-Day Notice to Quit (Month to Month Tenancy) – This form is used to inform a tenant that they must vacate the premises at the end of thirty days because the landlord does not intend to renew the lease. Rent is late when it has not been received by the landlord by the date due as set forth in the lease. However, when a landlord gives written a notice of the failure to pay rent, he or she must give the tenant three (3) days to pay before beginning the eviction process. Step 1 – Depending on the issue, the landlord must provide notice to the tenant of his or her intention of beginning the eviction process if the tenant does not either move out or fix the problem. If the tenant has failed to pay rent, the landlord can use a 3-Day Notice to Quit (Non-Payment of Rent). If the tenant has failed to abide by the terms of the lease, the landlord can use a 3-Day Notice to Quit (Non-Compliance). If the landlord wants to end a month-to-month tenancy, the landlord can use the 30-Day Notice to Quit (Month to Month Tenancy). Step 2 – If the tenant does not respond to the notice and continues to live at the premises, landlord may begin eviction proceedings, called unlawful detainer, by filing a Summons and Complaint with the Local District Court and paying the filing fee of $166. In addition, Landlord will have to provide Affidavit of Service certifying that the landlord provided the requisite notice to the tenant. The landlord must have these served by a process server on the tenant. These forms are for an expedited eviction, which would not include damages for back rent. If the landlord wants to obtain damages, he or she must file a separate case in small claims court or district court, depending on the amount owed. Step 3- Tenant has five days to respond to the summons and complaint. Landlord must provide to the court an Affidavit of Service of Summons and Complaint certifying that the summons and complaint was properly delivered to tenant by a process server and a filled out Judgment for Eviction for the judge to sign. The judge will sign if the landlord prevails in court or if the tenant fails to respond to the complaint and summons. Step 4 – If the landlord needs a sheriff to assist with the eviction after he or she has obtained a Judgment for eviction, he or she can prepare a Writ of Restitution. This will have to be filled out and signed by the clerk of the court. The landlord may then provide the writ to the sheriff and they will evict the tenant. You will need to have at least two documents in order to fill out this form: the Lease in focus and a blank Idaho Notice to Quit form. The form may be downloaded on this page through the PDF, ODT, and Word buttons presented with the image on the right. On the blank line just below the document title, enter the Full Name of the individual this Notice will concern itself with. The Address of the Rental Property must be reported in the opening statement. The facts here must match those in the Lease being referred to. On the first blank space, enter the Property City. The second blank space requires the Property County filled in. The third blank space must have the Property Zip Code reported. The fourth blank space will need the Property’s Building Number and Street to be documented. If there is a Property Apartment Number or Unit Number, this must be entered in the last blank space of the opening statement. The second statement of this form will need the Signature Date of the Lease being referred to be listed. Enter the Lease’s Signature Calendar Date of the Month on the blank space after the words “signed on the…” Then on the space after the phrase “day of…” enter the Month of the Lease’s Signature Date. Finally, on the space after “20,” enter the Year of the Lease’s Signature Date. You will need to provide a reason for issuing a Notice. That is, what are you informing the intended recipient of. If the recipient is a Tenant who was financially negligent with his rent payments, then select the checkbox for the first checkbox. Report the Name of an Authorized Agent to receive any past due amounts, in case the undersigned is unavailable, in this statement. Also, document the Amount Owed and the Time Period that is delinquent. This statement will declare the Tenant has three days to supply the Overdue Payment for this Time Period or return the Rental Property to the Landlord. If the recipient is a Tenant who has not upheld the requirements of the Lease or has simply been noncompliant with its terms, then select the second checkbox and cite the exact breach of contract on the blank space. This statement will declare the Tenant must correct the situation and comply with the Rental Agreement in three days or return the Rental Property to the Landlord. If the recipient is a Landlord who must be given Thirty Days’ Notice the Month to Month Tenancy he or she participates in will end, then select the fourth checkbox. Also enter the Calendar Date, Month, and Year of the Lease’s Termination on the blank spaces in this statement. The paragraph following the previous sections must be read and Signed by the Landlord or issuing Landlord Agent. It is important to be able to verify the receipt of this document to the intended recipient. The Delivery Agent will need to provide such verification by indicating several facts then providing a binding Signature. In the last section, the Delivery Agent will need to report the Date he or she affected Delivery and to whom it was delivered to in the first statement. Additionally, the Delivery Agent will check the first checkbox present to indicate the Notice was delivered successfully to the intended recipient, the second check box if the Notice was entrusted to a reliable member of the intended recipient’s household or a co-worker where the intended recipient is employed, or the third checkbox if a personal delivery was not possible and the Notice was mailed to the intended recipient using First Class Mail. The Delivery Agent should only Sign this document once Delivery is complete.